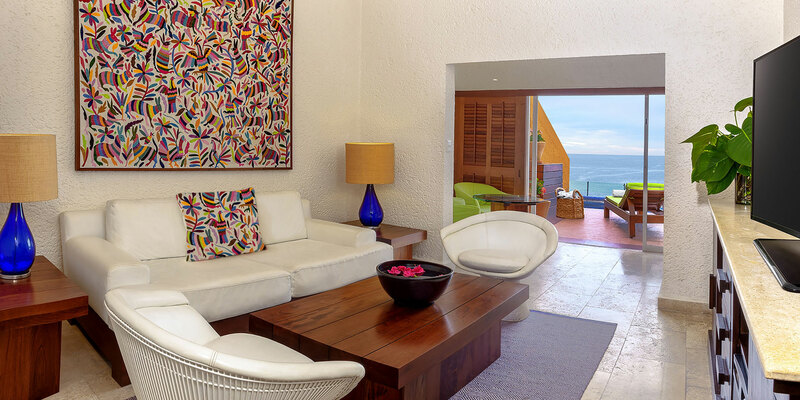 Each boasting its own private terrace with spectacular views, our accommodations range from luxurious 3 bedroom suites to exclusive Beach Club rooms with lounge access. 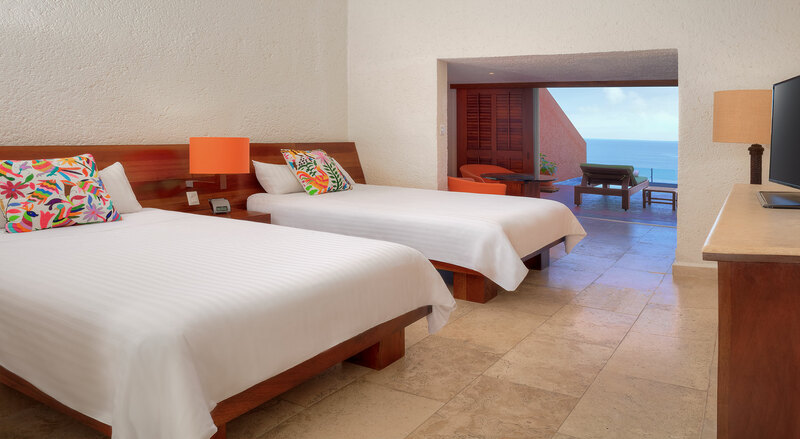 Enjoy luxurious pillow top beds and your own private indoor and outdoor sitting areas. 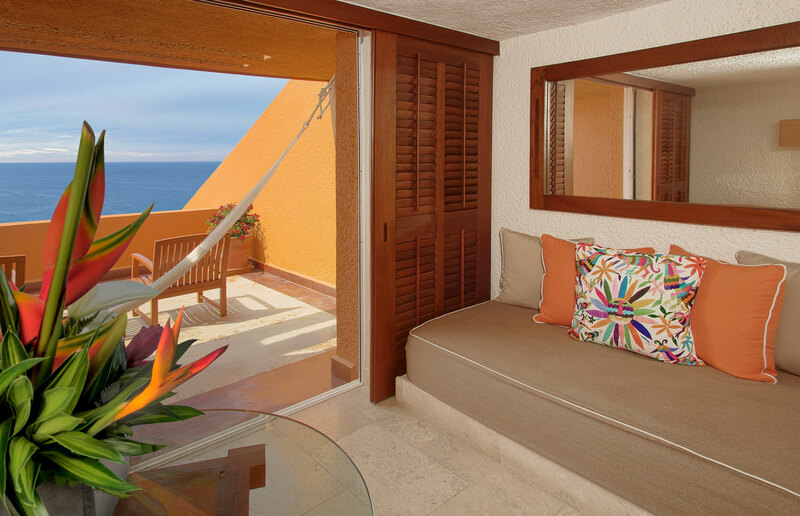 Relax in the hammock on your secluded terrace as you take in spectacular views of the bay. Located on the 10th through 19th floors. These are meant for 2 adults. Air conditioning, pillow top beds, private terrace with hammock and sitting area, indoor sitting area, contemporary bathroom, TV, minibar, coffeemaker, telephone, safety deposit box, ceiling fan, alarm clock, iron, hair dryer. 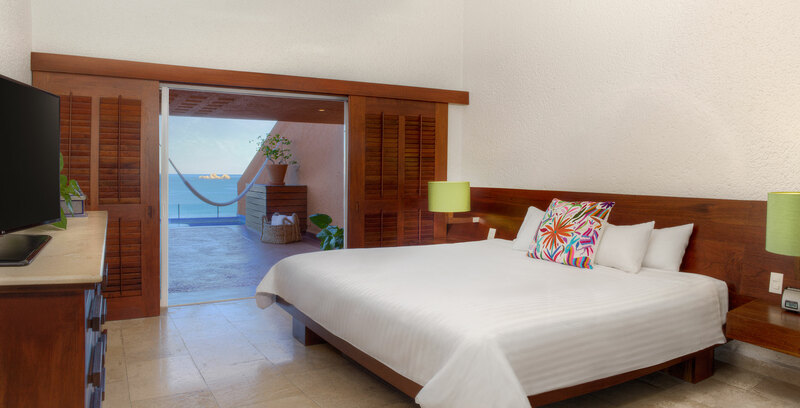 Our gorgeous Brisas Beach Club Rooms come with access to a daily continental breakfast and evening cocktail hour in the Brisas Lounge. 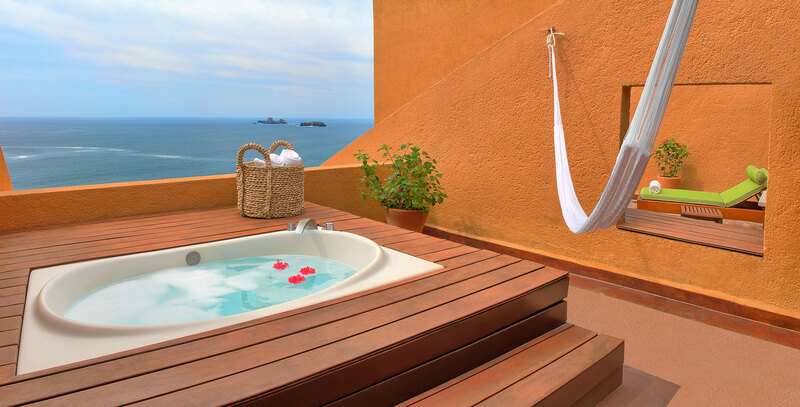 Enjoy spectacular views of the bay from the privacy of your own oversized terrace. Rooms located on the 20th and 21st floors. These are meant for 2 adults. No minors are allowed in this category. 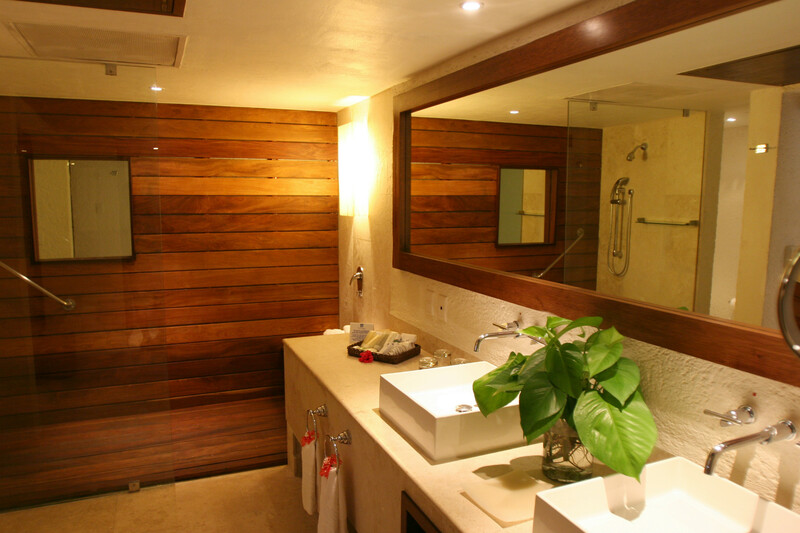 Continental breakfast, cocktail hour, air conditioning, private terrace with hammock and sitting area, indoor sitting area, contemporary bathroom, TV, minibar, coffeemaker, telephone, safety deposit box, ceiling fan, alarm clock, iron, hair dryer. 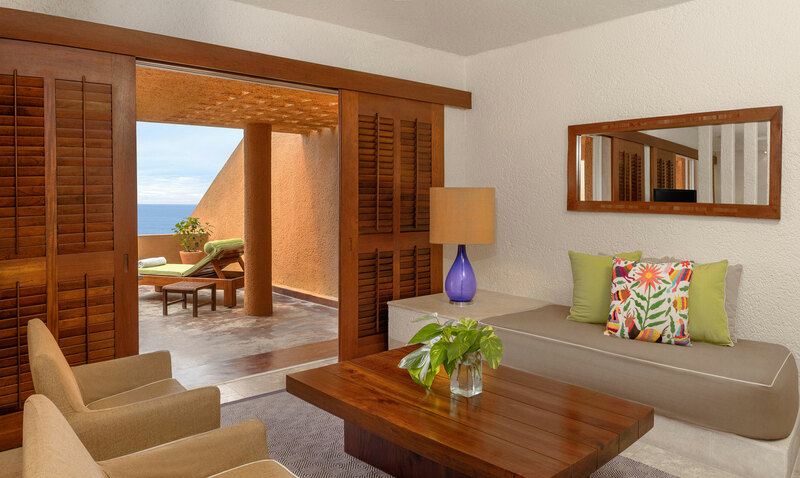 Best suited for honeymooners, these one-bedroom suites come with a king bed and a living room. 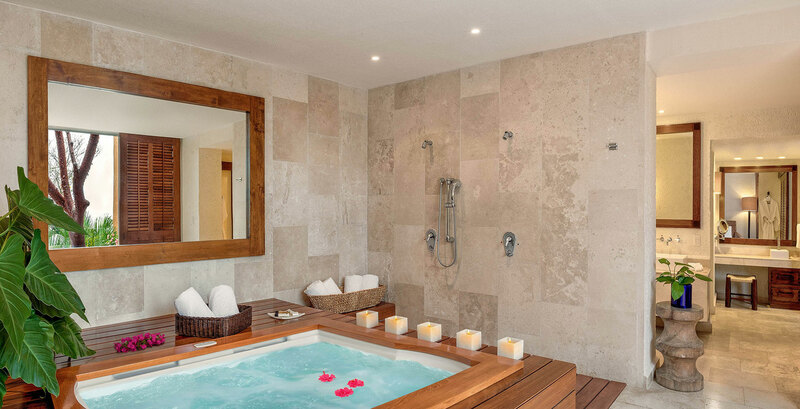 From your private terrace, you can enjoy spectacular views of the bay and a dip in your own whirlpool. These are meant for 2 adults. Living room, dining area, private terrace with whirlpool and hammock, marble floors, air conditioning, contemporary bathroom with deluxe amenities, flat screen TV, minibar, coffeemaker, telephone, safety deposit box, ceiling fan, alarm clock, iron, hair dryer. 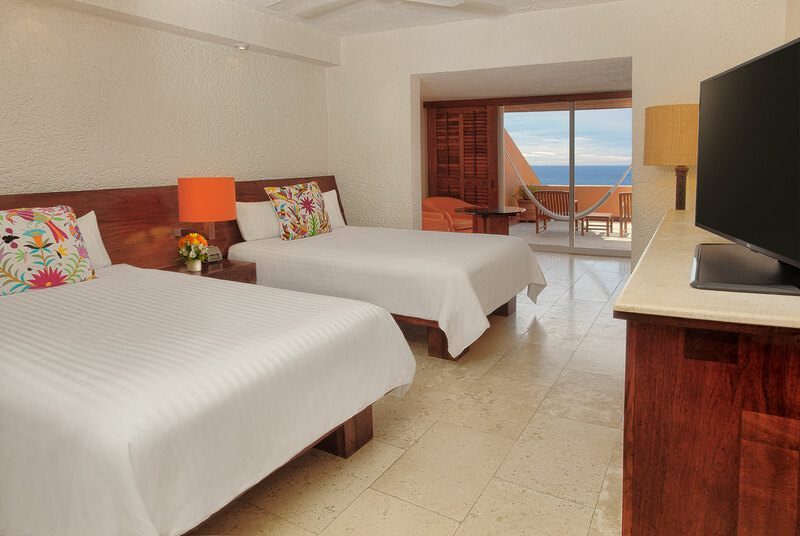 Enjoy more of your own space in these larger one-bedroom suites, each with a king bed and living room. 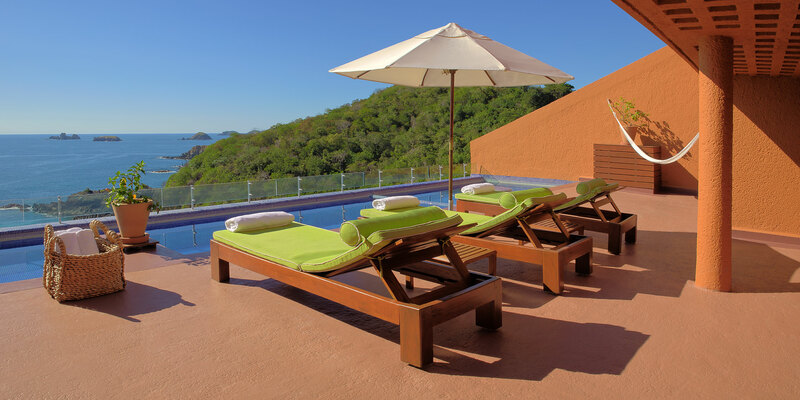 From your oversized terrace, you can take in gorgeous views of the bay. These are meant for 2 adults. Living room with leather sofa, dining area, private terrace with private pool and seating, marble floors, air conditioning, contemporary bathroom with deluxe amenities, flat screen TV, minibar, coffeemaker, telephone, safety deposit box, ceiling fan, alarm clock, iron, hair dryer. 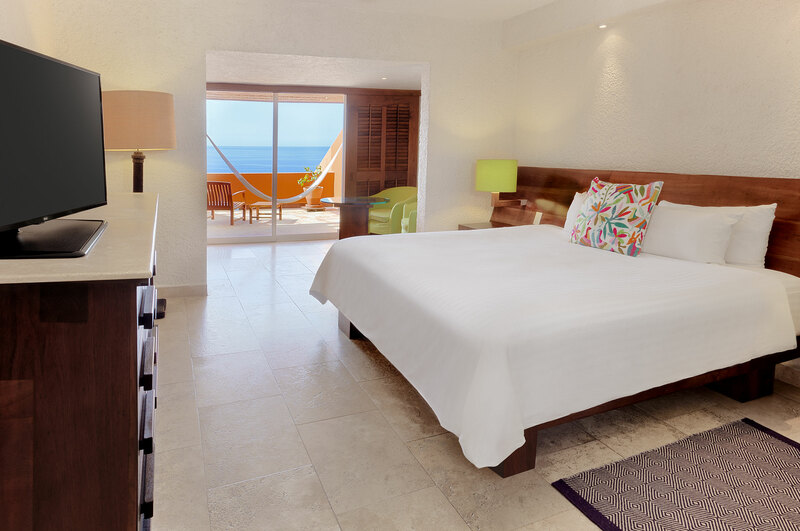 Delight in the luxury of personal space in our two-bedroom suites. 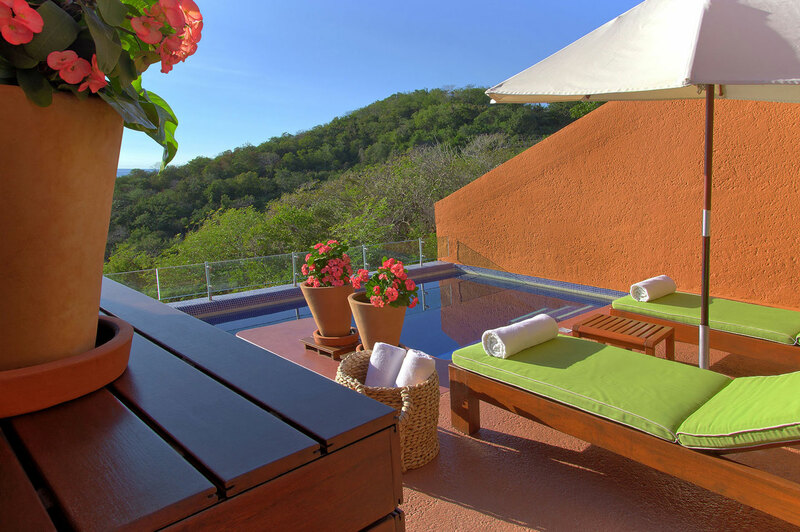 Take in incredible views from your terrace, which includes a hammock and private pool. Maximum capacity: 4 adults or 3 adults and 1 child or 2 adults and 2 children. 2 bedrooms (1 king bed, 2 double beds), 2.5 bathrooms, living room with leather sofa, dining area, private terrace with private pool and seating, marble floors, air conditioning, contemporary bathroom with deluxe amenities, flat screen TV, minibar, coffeemaker, telephone, safety deposit box, ceiling fan, alarm clock, iron, hair dryer. 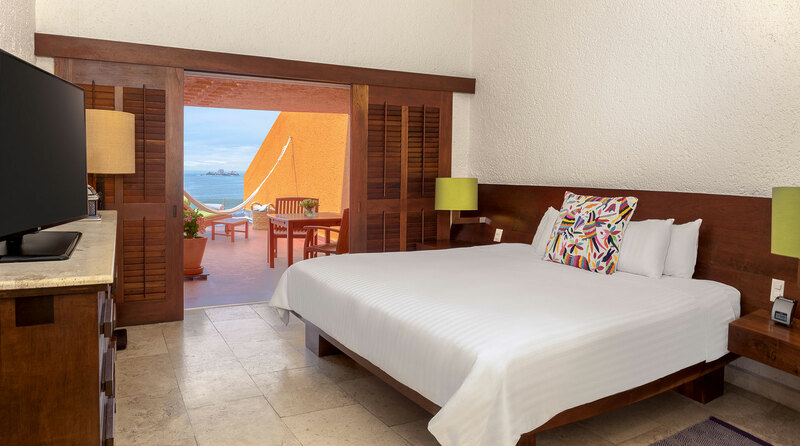 With a king bedroom, a second bedroom with 2 double beds, a private sitting area, a living room, separate dining area, and 2.5 bathrooms, these suites have plenty of places for you to truly relax. 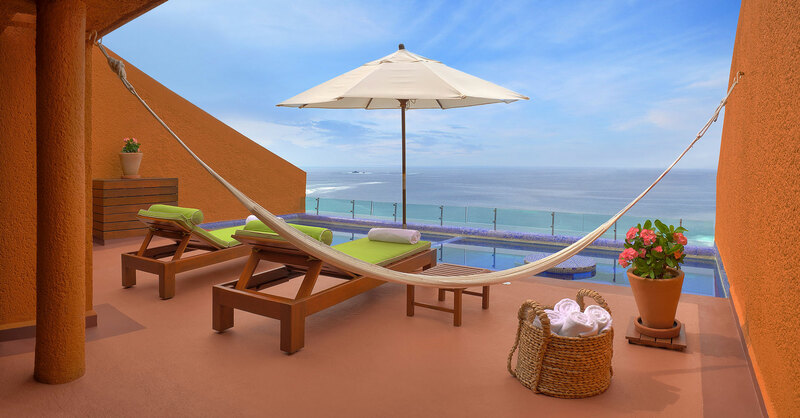 From your oversized terrace, you can take in exquisite views from the hammock or your private pool. Maximum capacity: 4 adults or 3 adults and 1 child or 2 adults and 2 children. 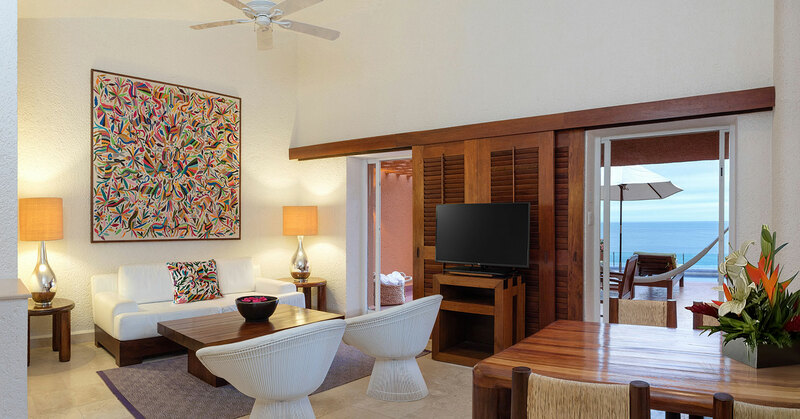 Our largest suites, each includes a master bedroom with a separate dining and living area and a private terrace with a whirlpool, a king bedroom, and a third bedroom with 2 double beds. They also feature an oversized living and dining area, as well as a spacious terrace with a private pool, hammock, table, and chairs. Children under 12 years old are not allowed in these suites. 3 bedrooms (1 master with private terrace, dining and living area, 1 bedroom with king bed, 1 bedroom with 2 double beds), 3.5 bathrooms, living room with leather sofa, dining area, private terrace with private pool and seating, marble floors, air conditioning, contemporary bathroom with deluxe amenities, flat screen TV, minibar, coffeemaker, telephone, safety deposit box, ceiling fan, alarm clock, iron, hair dryer.